Monkey Music introduces music to very young children in a way they can easily understand and enjoy. Based on an innovative and progressive curriculum, Monkey Music provides thousands of parents, carers and their children with weekly music classes that are entertaining and educational. Monkey Music is widely recognised as the UK’s premium pre-school music brand. Our family friendly career opportunity is delivered by an award-winning network of around 50 franchisees. 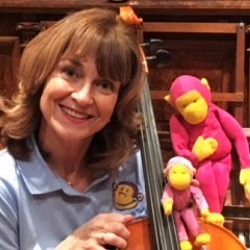 Having initially joined Monkey Music as a teacher in 1997, Rebecca Maskell became their first Monkey Music franchisee in 1998, taking over the area from the CEO and Founder of Monkey Music, Angie Coates. During the intervening years the business has gone from strength to strength, with 22 weekly classes currently running across the franchise area of Dulwich and Herne Hill, serving a customer base of over 200. The company’s longest-standing franchise, it is testament to the strength of the Monkey Music brand that the majority of customers are generated by recommendation, based on the excellent local reputation. Classes are delivered in six excellent venues across the area, Punk Me Up Ceramics Café East Dulwich, Francis Peek Community Centre Dulwich Park, Goose Green Community Centre East Dulwich, Herne Hill Baptist Church Herne Hill, St Faith’s Church Herne Hill and Edward Alleyn’s Clubhouse Dulwich - each of which has been judiciously selected in terms of cost, location, access, parking and learning environment. The relationship with the majority of these venues is long-standing, with Monkey Music regarded as a highly valued business partner. After 20 highly successful years with Monkey Music, the time has come to move on. The franchise provided an excellent opportunity for Rebecca to run a profitable business whilst raising four children, all of whom are now grown up and flying the nest! Equally the impressive infrastructure and support from Monkey Music Limited has enabled her to acquire and develop a range of invaluable business and interpersonal skills. By offering the franchise for sale at this time, Rebecca is confident that the new owner will not only benefit from the legacy of a well-managed and highly regarded local business, but will also have the opportunity to make their own mark on its future, just as Rebecca did 20 years ago. Please let us know if you have any questions regarding this resale or if there is specific information we can send you.